Look at him. This is the picture of a liar, lying. More than 27 million people from all over the world have visited since. For the memorial and museum, you received donations from contributors in all 50 states and 126 countries. Daniels directed planning, construction and development for both projects and led the foundation in a fundraising campaign that took in more than $450 million. After 11 years, you are leaving. Why? What was important for me was that we were up and running and everything opened and we made sure the business model worked. So all of the major things that I wanted to see happen have happened, and now, with the 15th anniversary approaching, it feels as if the appropriate time is here. I’m 44 years old and I’m going to take on another big challenge in my life, and it seemed like the right time to do it. You were a consultant at McKinsey & Co. and an attorney at Cravath, Swaine & Moore before entering the nonprofit world. What drew you to it? When dousing yourself in propaganda, why not go to a pure source? Let's have some fun looking at a typical article in which the military and its Internet trolls try to ramp up patriotic feelings with more cognitive dissonance. Sure, America. You're not propagandized at all! The other was in Shanksville, Pennsylvania, where it's believed passengers on United Flight 93 crashed the plane rather than allow it to hit the terrorists' target. Is this the moment Bigfoot was spotted on camera in Britain? Click on your video feed. Give Tavistock the insight they deserve. Anyway, where were we? Afterward, the flag was carried away to the sound of bagpipes. The son of Vincent D'Armadeo, a victim of the Twin Towers attacks, stepped up to recall his father. What the-?! Who the hell is that? Vincent D'Armadeo? He's not under "A" or "D" in any memorial. Did you mean Vincent D´Amadeo? This flying angel? This grimacing saint? What's with the "R"? How dare you mangle this victim's name. How dare you. He spoke movingly of how America came together in support of those directly affected by the attacks. He was the first of several victims' children to recall the loss they bore when America faced its darkest day, 15 years ago. Many speakers were in their twenties, recalling fathers, mothers and siblings that they had not spoken to or touched since they were just young children. Parents, brothers, sisters and other family members also spoke out. 'It doesn't get easier. The grief never goes away. 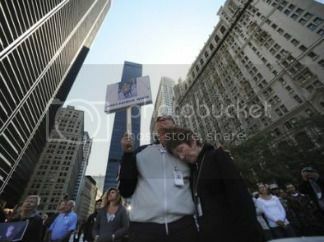 You don't move forward - it always stays with you,' said Tom Acquaviva, who lost his son, Paul Acquaviva, in the attacks. Wait, now we're counting parents again? I'm so torn up. I need to maybe look down the click hole again. Thank goodness, here it is. Although this is the 14th memorial to the dreadful events of that day, the effects of that time are still felt strongly by those who were directly affected. James Johnson, a retired New York City police sergeant who is now police chief in Forest City, Pennsylvania, was there for the first time since he last worked on the rescue and recovery efforts in early 2002. Some who spoke wished for more tolerance in America's future. 'The things we think separate us really don't. We're all part of this one Earth in this vast universe,' said Granvilette Kestenbaum, who lost her astrophysicist husband, Howard Kestenbaum. The tolling of a single bell signified the exact moment that a plane struck the first tower. As well as those gathered outside in New York, others chose to remember the fallen in the National September 11 Museum there, which had announced it would be closed to all but the victims' families until Sunday afternoon. President Obama observed the somber anniversary with a moment of silence in the Oval Office at 8:46am EDT - the exact moment a hijacked airplane slammed into the north tower of New York City's World Trade Center. He then went to the Pentagon, where he laid a wreath at the beginning of a memorial service. That service opened with a prayer for those lost, followed by a moment of silence commemorating the moment that United Flight 77 hit the building. The American people, he said, are 'bound by a creed as old as our founders, e pluribus unum - 'out of many we are one'. ... He concluded: As Americans, we do not give into fear. We will preserve our freedoms and the way of life that makes us a beacon to the world. The American flag is flying at half-staff atop the White House and other federal buildings. Obama has invited governors, interested organizations and individuals to follow suit. Andy Card, former chief of staff to President George W Bush, recalled to CNN how he had no idea the Pentagon had been hit at first - only that there was a silence on the phone line. He also recalled how President Bush had made one of his first actions to call Vladimir Putin, to tell him that America would not be immediately leaping to war. Also speaking to CNN in an interview recorded days ago, Hillary Clinton recalled how she was on her way to a Senate meeting when she first heard a plane had struck the World Trade Center. 'I went the next day Chuck Schumer and I, we were one of the very few planes in the sky that day,' she said, recalling how she approached New York, and then Manhattan in a helicopter. 'We went over, circled, the burning pile and when we landed we met up with the Governor and the mayor and went walking toward Ground Zero and as we moved farther south hand[?!?] we aw this curtains of black smoke that was stretched across the island, basically. She also described of how President Bush immediately agreed to give $20million to help support the city after she and Schumer approached him. And also spoke of how workers on the ruble were affected by the 'toxic brew' in the air, and how officials denied there was evidence it was damaging to people. 'You could see the evidence you could smell it you could taste the evidence,' she said. Meanwhile, Donald Trump released a written statement addressing the tragic day. 'Today, we mourn for all the lives lost,' he said. 'We mourn for all the children who had to grow up without a mom or dad, and for all the parents who've had to struggle on without their children. He also remembered those who fought terrorists on Flight 93, and those in the Pentagon that day. On CNN, Monsignor John Delendick, a FDNY chaplain spoke of how the was called in to the Twin Towers on the attack. Initially, he said, he thought the first strike must just have been a small plane, and then that the second was just a pilot 'coming in for a look - showing how incomprehensible the attacks were at that time. He also talked about watching people jump from the towers. 'They had a choice to die either by fire - a terrible way to die - or die clean,' a colleague told him. He also recalled how a police officer ran up next to him and asked if he could hear his confession. In a statement, the department said that 'for security reasons, we will not provide specific security details'. But the department said an 'adequate detail will be in place' around the city. People across the nation came together on the eve of 9/11 to prepare for the 15th anniversary of the terror attacks that claimed the lives of nearly 3,000 innocents. Families, friends and strangers alike joined hands across the nation to honor both those lost in the attacks, and those who made the ultimate sacrifice for their country during a time of terror. 'We remember what the members of the FDNY did in the face of something that could not be imagined,' he said. Hundreds of family members of those who died and those who survived the attacks listened to their loved ones remembered for their courage on a day that would claim the lives of more firefighters than any other day in the nation's history. Each of the names of the dead firefighters was read aloud during the service. Attorney General Loretta Lynch read a letter from President Barack Obama that described the effect left on the nation after hijacked planes struck the twin 110-story towers of the World Trade Center, causing their collapse. The university, which is located in Malibu, California, placed around 3,000 US flags in the ground in tribute to the nearly 3,000 victims lost in the attacks. As the flags flew, students and staff were captured walking among them as they paid their respects on the eve of 9/11. Painted patriotic ribbons adorned the 25 yard line of Kyle Field in College Station, Texas, in honor of the anniversary of 9/11 before the start of an NCAA college football game between Prairie View A&M and Texas A&M. Visitors in Pennsylvania honored those who lost their lives on Flight 93 as they made their way through the Flight 93 National Memorial. Dozens lit candles in memory of the passengers and crew of Flight 93 and carried them to the Wall of Names. Edward Noon, 22, of the Pennsylvania National Guard, paid tribute to the passengers and crew of Flight 93, while candles remained lit along the Wall of Names. The heroic men and women of Flight 93, who had just left Newark, New Jersey, and were headed to San Francisco, devised a plan, held a vote, stormed the cockpit and sought to take control of the jet from their hijackers. Although their plan failed, they were still able to force the Boeing 757 to crash, preventing it from hitting its likely target, the US Capitol, just 20 minutes away by air. Authorities told NBC that 'as of now, there are no specific credible threats to New York City'. The State Department also urged Americans to be vigilant about their personal security, NBC reported. The latest worldwide caution from the State Department says: 'Current information suggests that terrorist groups continue to plan attacks in multiple regions. Saturday afternoon, the Six Flags America theme park in Upper Marlboro, Maryland, was evacuated because of a bomb and shooting threat. State police received a phone call warning that there was a bomb inside the park, NBC Washington reported. The person on the phone, who called around 1.30pm according to Fox 5, also said that people at Six Flags America would be shot. Authorities told Six Flags America about the call and asked them to evacuate visitors. Yup, I'd say they pretty much barely qualified for the article's actual premise. Don't worry, doctors. It's entirely normal for chronic liars to have the occasional nervous break down and/or panic attack. Life After Death is a documentary about the families of Arab, European and American victims of terrorist attacks and their compelling stories of suffering, endurance and hope. The film features Granvilette Kestenbaum and her daughter Lauren, who lost husband and father Howard on 9/11, as the two travel and reach out to family members of victims of the 11/9 Amman hotel bombings and the 3/11 Madrid train bombings. Life After Death is a Visionaire Media production in association with Layalina Productions. It is produced and executive produced by Academy Award nominated Jerome Gary and Layalina’s President, Leon Shahabian, and directed by Shawn Thompson. Layalina Productions is a 501(c)(3) non-profit public diplomacy initiative based in Washington, D.C., that develops, produces and distributes television programming throughout the Middle East and North Africa. Inaugurated in March 2002, Layalina aims to dispel negative stereotypes of the other and help increase mutual understanding between the U.S. and Arab-speaking countries. Hoi - I enjoyed your post and humour. It has got to the point where I can't even bring myself to watch this crap anymore, so my contributions to the 9/11 hoax are pretty much what is already on here and the Reality Shack before it. This doesn't stop me being an avid reader still but I have no time to spend on proper research anymore. I do hope, though, one day, before I leave this mortal coil, that WE, as a collective made some difference to the control that certain elites and media have over the World's population. For my part, I challenge my children not to believe everything they see or are taught at school. 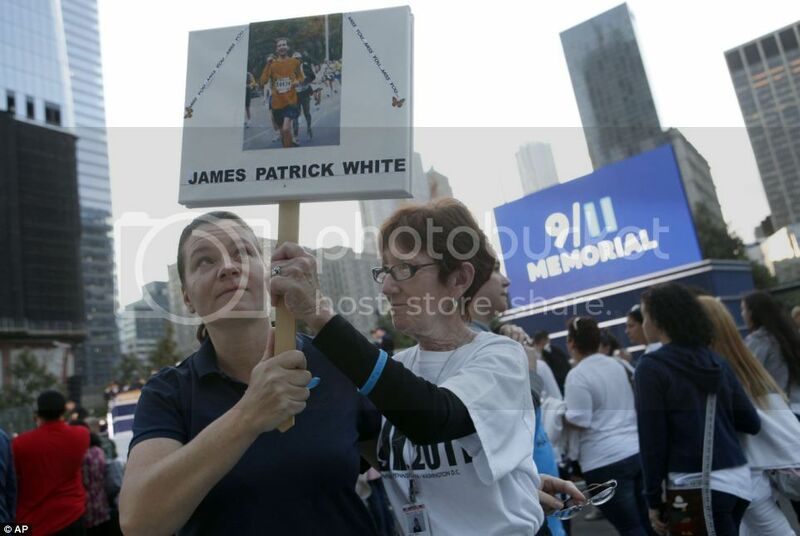 If you had genuinely lost a loved one on 9/11 would you tack an old photograph onto a stick and hold it aloft? of course not. Even funnier, why are all of the sticks that aforementioned photos are attached to all the same type? Surely they aren't distributed by a single source? Why do the relatives of Gary J Frank still use the same crappy photo of their loved one (the only one available on the internet and used at various Memorial websites)? I'm guessing that this is the same one they used when he went "missing" seeing as they are still letting us know who he worked for and what floor he worked on! 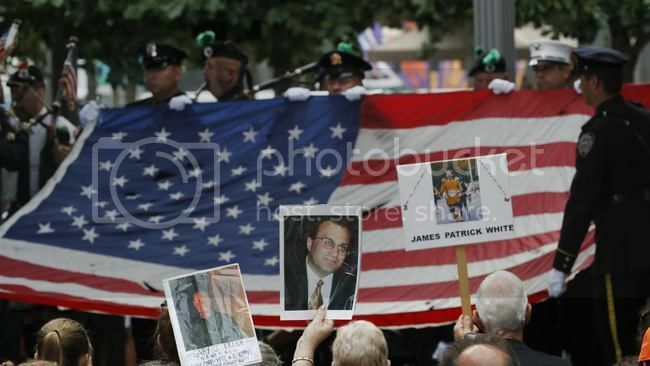 And why would the relatives of James Patrick White still have the same photo/stick that they took to the 2012 remembrance parade? And why is the lady on the right stifling a grin? As they say; WE MUST NEVER FORGET. Edit: Photos added and text tidied up.